The shot came from the right face-off circle. It was a low snap shot that I dropped down for as it clapped off my stick blade and straight up into the air. I spotted an enemy forward heading towards the spot the puck would be coming back down to earth so I decided to swing my stick into the air and knock it away. I made solid contact and propelled the puck back over my head and into the net. That was the 12th goal but it's not the story of the night. The first goal was a rocket that beat me blocker side even after I moved above my crease to meet the shooter. 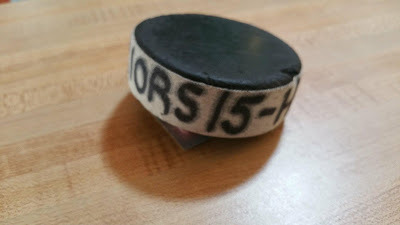 Alright, I can't remember every goal of a 15-5 loss last night but something became even clearer in my mind. I have found the ceiling in my game. By a series of comedic errors, the Puck Hawgs ended up playing in the top division in a recent state tournament and we played against ex-college and junior players and I got beaten early and often. I saw pucks go by me in tight spaces over my shoulder, slap shots that I had no chance of ever catching up to and moves in tight that left me lost and confused. Last night in league play my team faced the top team in our division– again due to a comedy of errors we are playing against teams we weren't meant to. Again I watched as shots beat me with speed, accuracy and skill that I am just not good enough to stop. Here is where I make a comment about how hockey is a team game and how the goalie is the last line of defense after the 5 players in front of him have done what they can but there's also another truth. I have found my ceiling. Finding that limit stings my ego but this blog can't be just stories of all the good things that happen to me or it won't be an honest accounting of my return to hockey. For now I need to accept that my skills and abilities don't match up with some players who had college or junior careers. I don't have the tools or athleticism to hang with a few of the best players you can face in beer league. I'll keep fighting against the ceiling and try to enjoy everything about my time in net for as long as this journey lasts. After all, 15 is a new high score. Time to celebrate.